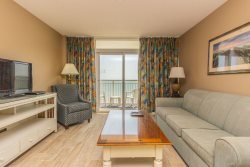 This studio is located at the Caravelle Resort in Myrtle Beach, and offers panoramic oceanfront views of the Atlantic Ocean. It sits on the 6th floor and has been completely renovated! Fresh paint on all walls, new flooring, brand new mattresses and bed frames, new dressers, new TV, new appliances, new cabinets, new toilet and vanity, and so much more! Guests can enjoy the luxury of having a fully-stocked kitchen, making it convenient for cooking small meals. We can accommodate 5 guests comfortably, sleeping 2 guests in each queen bed, along with a rollaway twin bed in the closet for the 5th guest! The convenience of an electronic, keyless entry makes check-in hassle free! Once inside our condo, our guests will also enjoy the ocean front balcony with panoramic ocean views. In addition, the outdoor pools and water features are a short elevator ride down to the 1st floor! Please note: The fitness center is currently undergoing maintenance and may or may not be available for your stay. No smoking, no pets allowed inside this rental. PLEASE NOTE: The attached parking garage ramp is currently being worked on until the end of April. Any guests booking during this time will need to use the parking garage across the street. Located at 69th Avenue, the heart of Myrtle Beach is only about 3 miles South, or an 8 minute drive. This condo is just minutes from the Carolina Opry, Alabama Theater, miniature golf, Barefoot Landing, The SkyWheel, Myrtle Beach Boardwalk and Ziplines, outlet shops, oceanfront dining and restaurants, piers and fishing, Market Common, Myrtle Beach State Park, and SO much more!